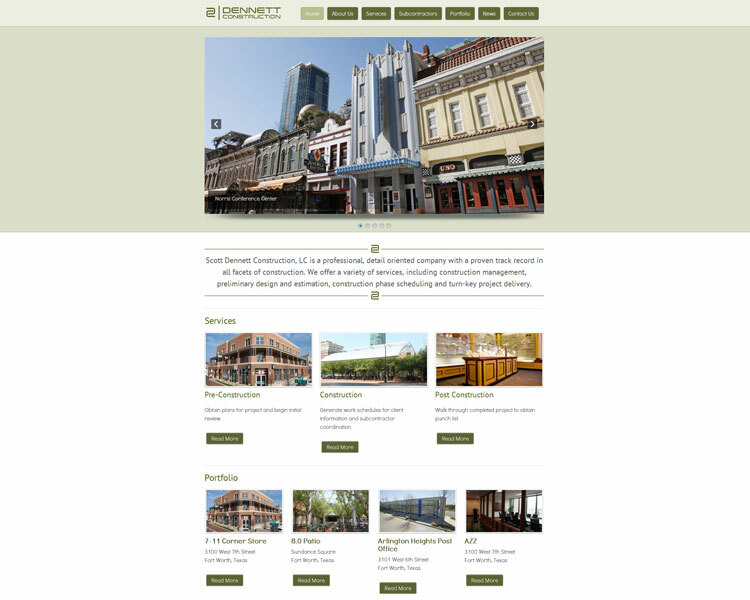 New website for the Dennett Construction company in Fort Worth, Texas. Features password protected subcontractor area and new portfolio area that highlights recent projects. Includes full-screen introductory slide page. We have been delivering innovative web sites and creative marketing solutions since 1995. Please contact us today for a free quote or with any questions about your projects. With my hectic work schedule, worrying about the website was the last thing on my mind. Luckily, Don was professional, timely and helpful. I highly recommend Dowell Interactive; Don’s creative work is affordable and high quality. Your website will definitely be in good hands. When I first ventured into the world of website marketing to promote my golf course, Don Dowell was the one who designed my site, secured my domain names and launched Battle Lake Golf Course into cyberspace. Thank you Don for showing me the way! I’ve worked with Don at Dowell Interactive for several years and refer him all the time! Don is responsive, timely, creative and so helpful on projects big or small. His innovative approach helped us use our budget dollars most efficiently, while still producing a quality web site. Thanks for all your work Don!